At EmbroidMe Albany, we are experts in logo embroidery and promotional products. We can become your partner for branding solutions to make sure your business stands out and is seen. We can brand anything from pens, USB memory sticks, drinkware, conference bags, hats caps, t shirts, polo shirts, hoodies through to entire national uniforms. Embroidery Albany one-stop-shop! Anything you can think of to put a logo on, we can help! If you’re in business, having a uniform will set you apart from your competitors. Your team will look smart and feel proud to be part of your business. Options range from a formal uniform to printed t-shirts, company jackets to embroidered caps and polar fleeces. And you’ll also find promotional items like pens, bags, gifts, hats and drink bottles. We know choosing can be stressful but we’ll make sure you get everything you need, when you want it. If you want your team to turn heads, or need more people to join your society or charity, we can help. Finding time to organise embroidery or screen printed t-shirts can be difficult when you’re fitting it in around work and other commitments. You can choose online, or call or visit the showroom. 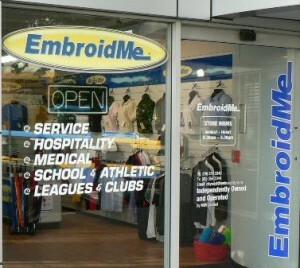 EmbroidMe Albany is located at 23 William Pickering Drive in the heart of the North Harbour business district. Contact EmbroidMe Albany today for our same day quote service! Call Your Local EmbroidMe Showroom! EmbroidMe City West Embroidery and Screen Printing One-stop-Shop! 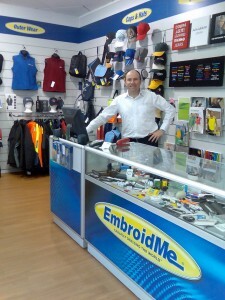 EmbroidMe Auckland City West for all your Embroidery, T shirt Screen Printing and Promotional Products! 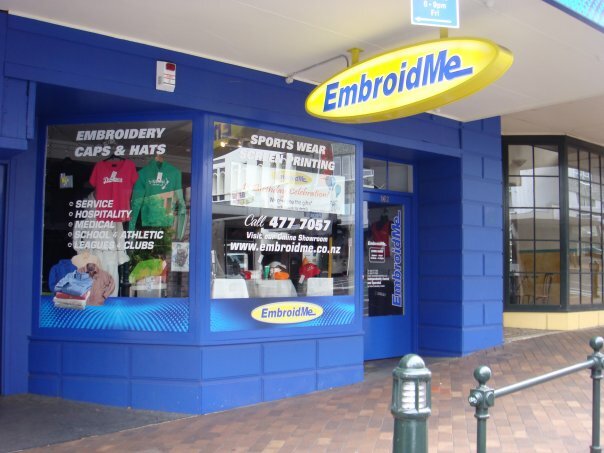 EmbroidMe Auckland City West is located in the “Heart of Auckland City.” We are your full service embroidery and screen printing centre. Serving clients throughout Auckland and beyond (in fact we have valued clients in Australia, Tahiti and even in the Mediterranean). Our large showroom stocks a wide range of clothing, caps, hats, bags and promotional items. You name it and we will source the right clothing and apparel for your budget and style! 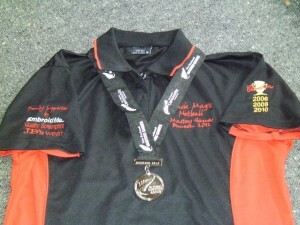 EmbroidMe Auckland City West can customise any garments and promotional product for your business! 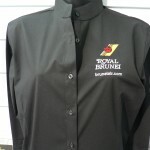 We can supply you with embroidery and screen printing for Polo shirts, T shirts, Hats, Caps, Business Shirts, Outerwear, Corporate Wear, Team Wear, Sports wear, Logo wear, Hi-Viz, Work Wear, Protective wear, Chef and Hospitality Wear, Contract; embroidery and screen printing, Golf Balls, Business Gifts, Imprinted Promotional Products, Pens, Pencils, Mugs, Stress Balls and so much much more. Our Embroidery Services use the latest computerised embroidery machines, on-site by experts. Our on site production facility uses the latest computer controlled embroidery machines and garment printing technology. To produce your brand or name onto the highest quality products, custom clothing and uniforms for your business, team, club, school, association, birthday party, exhibition, event and showcase. See our machines in action on YouTube, click here. In a highly competitive market place we all need to make sure the people who count know who you are and crucially, remember you when it’s time to place that all important order. Promotional products and gifts offer the opportunity to show clients that you value them and their business whilst promoting your own. This may vary from a pen, stress ball, golf umbrella, to a desk diary or briefcase. Our passion is embroidery and screen printing! We look forward to seeing you. You can also follow us on Facebook, Twitter, YouTube and Linkedin! EmbroidMe Auckland City West, New Zealand. At EmbroidMe we have preferred suppliers who provide us with the highest quality jackets available in New Zealand! 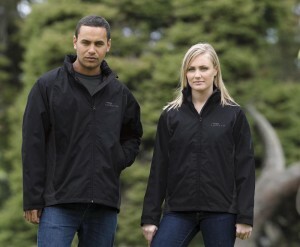 Our supplier TheCatalogue.co.nz have an amazing range of clothing and apparel for business and all the family. 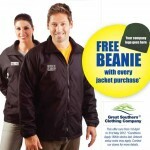 A great way to promote your business, local school, association or sports club is with branded clothing and apparel. All our EmbroidMe Showrooms located in Albany Auckland, Auckland City West, Newmarket Auckland, East Tamaki Auckland, Hamilton, Rotorua and Dunedin have a great selection for you to see. We can advise you for the right branding solutions for your budget and style. There is no minimum order and we also sell directly to the public if you would like to order a gift with the person’s name or business embroidered or digitally printed on the clothing. 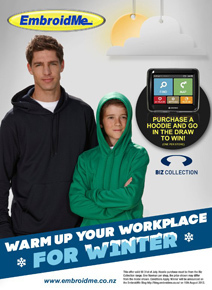 With winter now here you need to stay warm and dry with a jacket for work and leisure. We have jackets to look great with a suit and tie to jackets for the outdoors on a building site or on the sports field. You name it, we will have it! 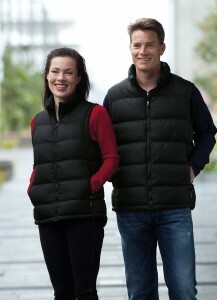 Our Puffa vests and jackets look great. For the cold wet days stay dry with our waterproof and shower-proof jackets. For indoors and under your shell jacket we have polar fleece jackets and soft shell jackets for the cold wind! To the see the full selection visit www.embroidme.co.nz and www.thecatalogue.co.nz. 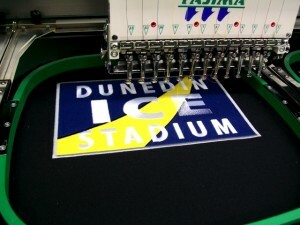 EmbroidMe Dunedin are your Embroidery and Printed Clothing Specialists. With computer generated images meaning accuracy and clarity for your logo. You also have the option of digital heatpress, vinyl heatpress, dye-sublimation and screenprinting. Exciting times ahead at EmbroidMe with our suppliers answering the call for more fashion-forward garments to keep your staff and sports groups looking sharp while wearing your brand. Most suppliers have got new catalogues out so feel free to have a browse through and request a quote via our online quoting facility. OR Give us a call and we can come to you with recommendations based on our experience in the industry. 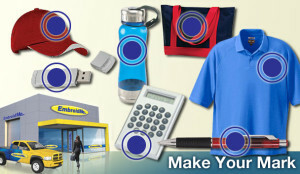 As well as apparel we also carry an extensive range of promotional products. Samples available for viewing in our showroom or in our online catalogues. If you have a target market you want to reach or need to keep within a budget (or are simply curious about what is out there) get in touch and we can hook you up with the right product on the day. Choose from pens, calculators, compendiums, bags, confectionery, keyrings, corporate ware, golf gadgets, torches, tools, flash drives, travel mugs, notebooks, teddy-bears, lanyards or maybe even a pair of jandals. If you want to receive updates about in-store promotions this year then feel free to request to be added to our online newsletter mailing list and receive a monthly update on what’s happening in the big world of branded apparel and promotional items. EmbroidMe, What we do best! EmbroidMe recognised long ago that not all designs are created equal. With the latest technologies and a wider range of available decoration options, there really is no end of choice and quality in the production of promotional materials and branded apparel. 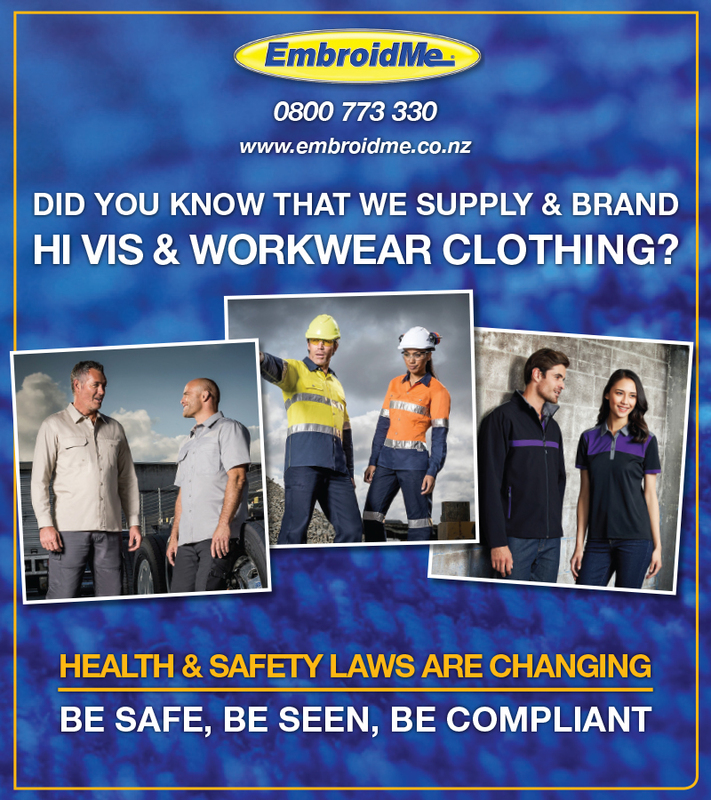 EmbroidMe Showrooms in Auckland, Hamilton, Rotorua and Dunedin provide the latest embroidery and digital printing technology for embroidered apparel, uniforms, business clothing, t shirt printing, caps, hats, branded apparel and sports clothing. Sourcing and supplying quality apparel and uniforms, embroidery, garment printing, and helping local businesses and teams with their brand identity and most importantly, to get noticed! 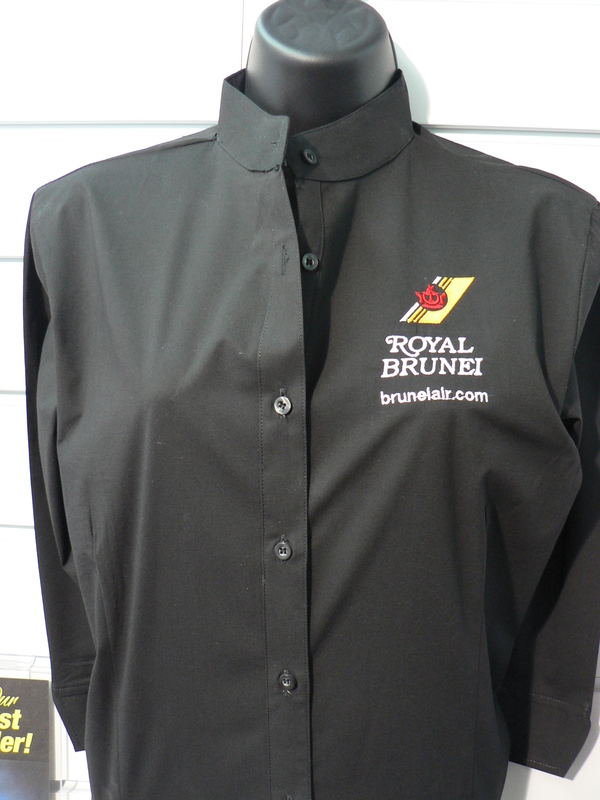 Ideal for business workwear, new uniforms, school uniforms, sports wear clothing, caps, hats, t shirt printing, clothing brands and promotional products, (including promotional pens, tote bags, compendiums and corporate gifts). To find the closest EmbroidMe Showroom, call FREE on 0800 773 330 or click here. We endeavour to help local schools, by reducing usual problems associated with ordering school uniforms. With fast turnaround times and low order quantities we make it easy to supply your school uniform shop efficiently. We will help by providing top clothing brands and a hassle free service giving great value for money. We supply Sports Clubs, Golf Clubs Clubs, Societies, and even famous individuals with embroidered, durable apparel, caps, hats and clothing brands. Personalised embroidery and digital printing can also be added to the garment, adding a distinctive feature for members. Through our relationships with suppliers all over the globe, we have access to products and materials that others don’t. With over 400 locations across the globe, we have the purchasing power of the World’s largest branded apparel and promotional products network. EmbroidMe is more than just your branding company. We can brand everything from pens through to entire national teams. Anything you can think to put a logo on, we can help! We are in the ‘branding solutions’ business. We have professional branding consultants who can advise the right apparel or promotional product solution for your business and budget. What is the biggest challenge you are facing in promoting your business? Let us know and we can help find the right solutions to your problems. Since 2000, EmbroidMe has continued to research and develop new branding solutions for our customers. Because of our size and our exposure to national and international world-leading technologies, we can bring you some of the most creative solutions available for your business. Through our National Accounts Department and team of expert project managers, we can handle any project no matter how big, or where it is located. EmbroidMe East Tamaki Auckland provides the latest embroidery and digital printing technology for embroidered apparel, uniforms, business clothing, t shirt printing, caps, hats, branded apparel and sports clothing. Sourcing and supplying quality apparel and uniforms, embroidery, garment printing, and helping local businesses and teams with their brand identity and most importantly, to get noticed! 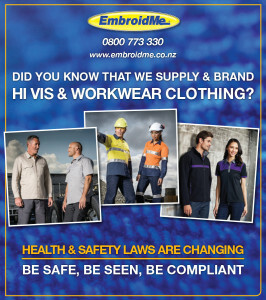 Ideal for business workwear, new uniforms, local schools uniforms, sports wear clothing, caps, hats, t shirt printing, clothing brands and promotional products, (including promotional pens, tote bags, compendiums and corporate gifts) please contact us at EmbroidMe East Tamaki Auckland and be delighted at what we can do for you. 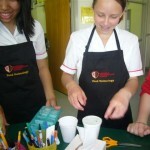 We endeavour to take away from the school, all of the usual problems associated with ordering school uniforms. With fast turnaround times and low order quantities we make it easy to operate your school uniform shop efficiently. We will help by providing top clothing brands and a hassle free service giving great value for money. 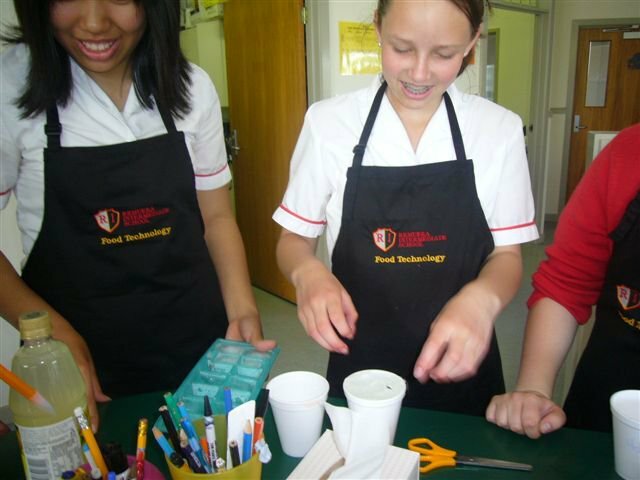 Each order is delivered to the school free of any freight costs. 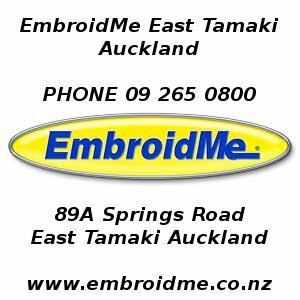 About EmbroidMe East Tamaki Auckland. EmbroidMe East Tamaki Auckland was opened in June 2006 and taken over by Wayne and Michelle Strong in Sept 2007. Each year the business has continued to achieve strong business growth and in July 2011 we reached a new sales record with the highest individual sales record for the NZ EmbroidMe Franchise network. Store sales were up 52% on the same quarter in 2010 which has been a great way to celebrate the store’s 5th year anniversary. We have invested in the latest embroidery and t shirt printing technology for business uniforms, sportswear clothing and corporate apparel. Wayne is a member of several business organisations including The Franchise Association of New Zealand the East Tamaki Business Association and BNI. Wayne’s team consist of four full-time employees and one part-time, who source and supply clothing and apparel from top brand suppliers and we use the latest computerised embroidery technology and t shirt printing for thousands of clothing products, apparel and promotional products for a large range of diverse customers including and not limited to: Schools, Day care centres, Large Corporates, SME’s, local small businesses, Sports Teams, Restaurants and Cafes, Tradesmen, Construction Industry, Cultural Groups, Non-profit organisations and Government Departments. Our wealth of experience and quality of service means that nearly 80% of our business is from existing customers and referrals. We are 100% New Zealand owned and operated and know the importance of brand awareness, corporate identity, branded apparel and the importance it has on your business bottom line. We focus on giving our East Tamaki, Pakuranga, Howick, Half Moon Bay, Bucklands Beach, Botany Downs, Greenmount, Otara, Flat Bush, Whitford, Beachlands, Maraetai, Clevedon customers, clothing brands, caps, hats and branded apparel and products, to suit every budget and expectation. We know the importance of brand awareness and corporate identity and the effect it has on the bottom line.We have a complement of embroidery machines configured to tackle any quantity with the highest quality work from one-off bespoke special gifts to thousands of embroidered logo’s for your business, club, school or team. Contact EmbroidMe East Tamaki today on 09 265 0300.